Captain James T. Kirk - mid transportation! Entertainment Earth Exclusive! Boldly collect what no man has collected before! Featuring the likeness of William Shatner in a simplified retro Kenner format, this 3 3/4-inch tall Beaming Captain Kirk ReAction Figure is a must for all Star Trek: The Original Series fans. Bringing the technology of the 23rd century to the action figure stylings of the 20th century, each exclusive figure fades from matter to glittery energy as if it was going through a Starfleet transporter! 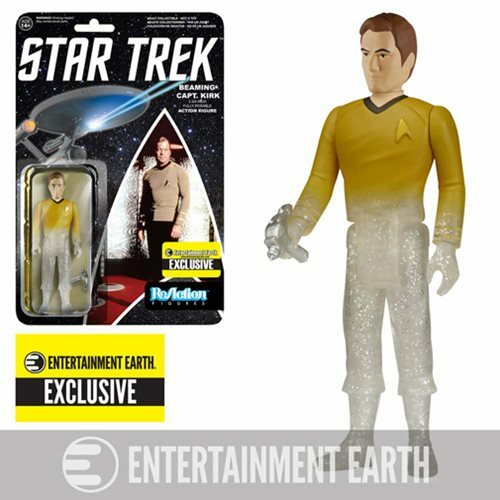 Captain James T. Kirk has 5 points of articulation and features unique accessories and the 1980s style card back design. He'll never be late for an away mission again! Don't forget to beam up Star Trek: The Original Series Beaming Spock ReAction 3 3/4-Inch Retro Action Figure - EE Exclusive as well (sold separately)! Agws 14 and up.